The Kriseman administration seems to be building a record of imposing their ideas, goals, concepts and ideological positions on the public. There has been an ongoing shuffle between the Kriseman administration and pro-life activist Scott Mahurin regarding Mahurin's request that the Pro-Life Flag be flown on the City Hall flag pole in September for the Forty Days of Life event. This whole flap arises from the Kriseman administration's decision to fly the Gay Pride Flag celebrating the City's Gay Pride event. I think we all knew this would be a problem at some point. Mahurin's position seems to be what is ok for the gay community should be ok for all of those unborn fetuses that are about to be killed. The Mayor has the sole right to determine what flag flies where around City Hall. That should probably be changed, and City Council is wisely letting the Mayor take the heat. There is a hint that the whole issue may be based on money, since the Gay Pride event does bring in a lot of visitors who spend a lot of money. Pro-Life, probably not so much. The City also flies flags for the St. Pete Grand Prix and the Rays home opener both large money events. Maybe what Mahurin and his group should do is organize a public event, request a parade permit, estimate the financial impact and see if that would move the Kriseman administration. 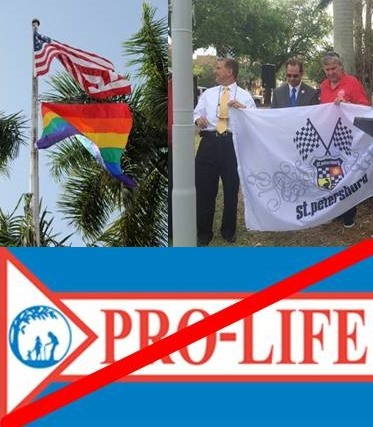 I am not particularly Pro-Life, but the point simply is if the Office of the Mayor, who controls what flags fly around City hall is going to make the decision on what they allow represented on what is really the people's flag pole based on economics, then the people no longer have a voice. The Kriseman administration seems to be building a record of not caring what the people think but instead imposing their ideas, goals, concepts and ideological positions on the public. It won't be too long before we have a chance to see how this form governance in St. Petersburg plays out at the ballot box.